Home › Ask the Vet › Hay Shortage – What Options Are There? Hay Shortage – What Options Are There? I hear there is going to be a severe hay shortage this winter because of the droughts and floods and I’m very worried that my horse will run out of food. Is there something else I can feed him or do you have a supplement that can replace hay? Long-stem forage is necessary for normal digestive function and normal behavior in the horse. When horses are allowed to eat forage (hay or pasture) free-choice, they spend 50% of their time eating or grazing. However, if pellets (even pelleted hay) are the sole source of forage in the diet, horses only spend 10% of their time eating. That leaves a lot of time for behavioral problems to develop such as wood chewing, cribbing, mane and tail chewing, or eating dirt or feces. It may also set the horse up for serious health problems such as colic, laminitis and ulcers. According to the Nutrient Requirements of Horses published by the National Research Council, horses should have a minimum of 1% of their body weight each day in forage. I’ll use my horse as an example. He weighs 1400 pounds and would need at least 14 pounds (1% of his body weight) of hay per day. Because hay bales and flakes can differ greatly in weight, I hung three flakes of his hay from a fish scale using baling twine to get an accurate weight. It came to seven pounds, meaning each flake weighs between two and two and a half pounds. By feeding him 3 flakes of hay morning and night, he is receiving 14 pounds of hay per day (plus pasture plus a multi-vitamin/mineral supplement). • Complete feeds – many commercial feed companies make an all-in-one product that contains both forage and grain (concentrate). When using complete feed as a hay stretcher, Purina Mills recommends replacing 50% of the hay with an equal amount of the complete feed and reducing grain by 0.5 to 1 pound. If replacing all of the hay and still feeding grain, feed the same amount of complete feed as you were feeding hay and reduce grain by 2 to 3 pounds. If using the complete feed as the sole ration, follow the directions on the bag. Don’t be surprised if you have to feed 15 to 20 pounds of a complete feed! • Chopped hay – “Regular” chopped hay can be added to the diet in any amount, to stretch long-stem baled hay. With its Safe Starch Forage product though, Triple Crown provides not only chopped hay in a bag, but has fortified it so that when fed as directed (at least 20 pounds per day for a 1000 pound horse) it provides a 100% complete and balanced diet. Read chopped hay bags carefully so that you know if the product is just hay that will need fortified with additional grain, a ration balancer or multi-vitamin, or has already been fortified like this product. • Hay Stretcher – Blue Seal makes this product, which is a large pellet with a nutritional profile similar to grass hay but slightly lower in fiber and higher in energy. It may be used to replace up to 50% of the hay in a horse’s diet on a pound-for-pound basis. Hay Stretcher is not fortified with vitamins or trace minerals so grain or a multi-vitamin/mineral supplement is still necessary. • Beet pulp – This high-fiber product has a nutritional profile similar to alfalfa hay, and may be used to replace up to 25% of the hay in a horse’s diet. Like HayStretcher, grain or a multi-vitamin/mineral supplement is still necessary to complete and balance the diet. 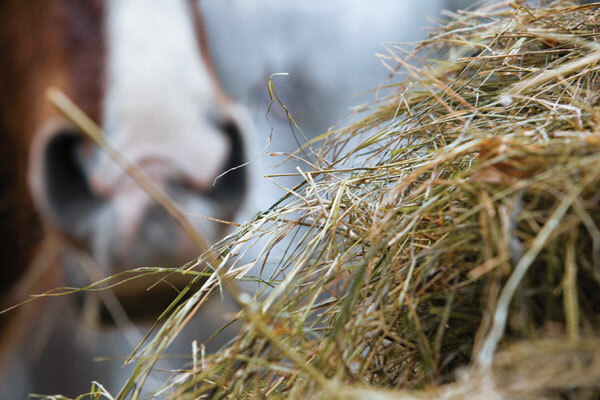 In addition to replacing part or all of your horse’s hay with one of these products, there are some additional things you can do to stretch his forage. Feed smaller, more frequent meals so he’s less hungry in between and also wastes less. Feed on a mat or in a tub to prevent further wastage. Use a small hole hay net to slow your horse’s consumption down. And do what I did and accurately weigh your hay so you know you’re feeding the correct amount for your horse’s size. Any time you change your horse’s diet, even if it’s from one kind of hay to another, there is the risk of a digestive disturbance that can lead to colic or laminitis. In fact, changes in hay increase your horse’s risk for colic by 10 times (vs 5 times when changing grain). Fortunately there are several products on the market specifically designed to protect the GI system. For example, EquiShure from Kentucky Equine Research contains a time-released hindgut buffer to decrease the chances of hindgut acidosis in at-risk horses. Yea-Sacc from Farnam stabilizes colon pH to help reduce the risk of digestive disorders and improves the digestibility of fiber. And our own SmartDigest Ultra contains prebiotics, probiotics, yeast and enzymes all shown to support normal GI function. Better yet, when it’s purchased in SmartPaks you are automatically eligible to apply for enrollment in ColiCare, our colic surgery reimbursement program. I hope you are able to find some reasonably priced hay this winter but if you aren’t, at least now you have some ideas to make what little hay you have last longer without risking your horse’s health. Thank you Dr Gray and smart pak for explaining the importance of forage in the horses diet and listing products that can help us stretch our hay ration. The info also helps those of us who have senior horses who find it hard to chew their hay. Thank you Dr. Gray. I do have one question. Because of the hay issues this year we do not have the luxury of having one hay source. We have three different sources of hay in our barn right now and at least two different cuttings. Our horses seem use to the variety now because we have been feeding them on a rotating basis. Is that possible, or are some of our horses still at risk from eating variable hay on a daily basis? Can you talk any more about “at risk” horses? That’s a great question Heather! Since the experts have confirmed that by far the biggest risk factor for colic in horses is a change in hay, I would recommend not rotating your hay on a daily basis (because each change increases their odds of digestive disturbance) but instead including some of EACH hay in their feedings. So say you have hay from three different sources and a horse typically gets three flakes of hay at his evening meal. Give one flake from each of your three different sources so the horse gets some of each source every day. If this is not possible, then try to gradually change over to your new hay over a period of seven to ten days. That is, start including some of the new hay, say 25%, for a few days, then up the mix to 50%, then go to 75% new hay, so by the end of the transition period you’re at 100% new hay. Don’t forget about the benefits of adding researched ingredients like prebiotics, yeast, and enzymes, which have been shown to help manage disruptions to the bacterial population in the hindgut, which is the primary cause of GI upset during feed transitions. There is also the alternative which is growing hydroponic fodder. It is inexpensive and nutritious.